Crew of the 38th/39th long-haul expedition to the ISS: Commander Mikhail Tyurin (Russia, RSA) during an overall training and tests on the Soyuz TMA-11M simulator at the Cosmonaut Training Center in Zvyozdny Gorodok. The Soviet Union opened its first cosmonaut training center 56 years ago this month, and it now prepares to meet the goals of a new generation of space explorers. On January 11, 1960 the Commander-in-chief of the Soviet Air Force, Konstantin Vershinin, issued a secret decree on the creation of a military unit for space travel training. This was the beginning of the Cosmonaut Training Center. The Gagarin Cosmonaut Training Center (GCTC) celebrates its 56th anniversary this month. The first group of cosmonauts was prepared in less than one year. Any other timeframe would have been unacceptable. Soviet reconnaissance data on American astronaut training spurred Soviet specialists to outdo their rivals. Scientists, cosmonauts and instructors labored tirelessly to achieve their goal. The central checkpoint, and then another one… At every checkpoint severe guards attentively study my face, meticulously search for my personal details on the list, and ask me to open the trunk of my car. Finding my surname, they immediately smile and kindly tell me, "Drive in!" On average preparation for a cosmonaut's first flight takes about seven years. Today, there are 37 Russian cosmonauts in training, 16 of whom are still waiting for their first space voyage. The group only has two women – Elena Serova, who completed her first flight in March 2015; and Anna Kikina, who is still on the waiting list. Among the cosmonauts there are not only military pilots, but also engineers, for example, Fyodor Yurchikhin and Sergei Krikalev, as well as representatives of other professions – Dr. Oleg Kotov; and the biologist, Sergei Ryazansky. Sergei Pavlovich Korolev, chief constructor at the experimental design bureau, OKB-1, explains that the first Soviet cosmonauts to be selected were jet fighter pilots. The committee reviewed 3,461 pilots, and after preliminary conversations and a medical exam, 20 were sent to training. In March 1960, the first group of cosmonauts arrived at the Frunze Central Airport in Moscow for their first space flight. Moscow did not have any special premises for space training and so it was held in a small two-story building that belonged to the CSKA sports center close to Dynamo metro station. Four months later, the group moved to the now world-renowned Zvyozdny gorodok (Star City) space training facility. The first group tested the boundaries of human abilities. The future cosmonauts were hurled in a centrifuge at a force of 12 Gs, and underwent testing in a thermo-chamber at a temperature of 70 Celsius for two hours. In April 1961, Yuri Gagarin became the first man in space with his legendary flight. 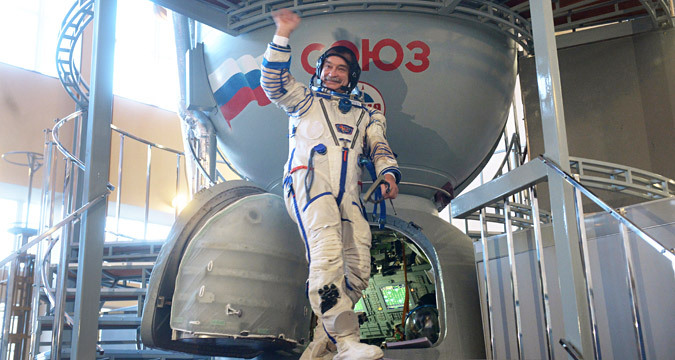 A few months later, German Titov proved that it is possible to live and work in space. In June 1963, Valentina Tereshkova became the first woman in space. These and other achievements confirmed the USSR's role as the leading space power, and the Cosmonaut Training Center in Star City became known as the best school preparing space explorers. Time passed and the GCTC changed. Cosmonaut training became less severe, but preparation significantly increased in duration. Important scientific research is carried out in the center and training base, which is something worthy of its entire own chapter. The Soyuz and ISS gyms have equipment and exercise machines with actual dimensions that helps cosmonauts successfully master all static and non-static situations during training. The hydro-laboratory, where the cosmonauts rehearse extra-vehicular work, as well as the large famous centrifuge, are currently being modernized. The center's needs are growing, and the equipment must be upgraded. The GCTC has its own airplane fleet, and conditions of zero gravity are provided by the modified IL-76 MDK. There are also training planes on which cosmonauts fly according to a special preparation plan, as well as planes used in visual observation and aerial photography.